Harry Joseph Press was born in Orange to Henry Joseph and Catherine Mary Press. He was educated at the Patrician Brothers’ School in Orange, where he developed an interest in cricket. After leaving school Harry secured employment with J Holmes and Co milliners and dressmakers. He later worked in the grocery department of Dalton Brothers, where “he was liked by all concerned, [and was] ever thoughtful and obliging.” He was also a bowler of some repute on the Dalton Brothers cricket team. On 14 December 1915 Harry was appointed to 13th Reinforcement 3rd Battalion. He embarked for overseas service on the HMAT A60 Aeneas on 20 December 1915. On 14 February 1916 Harry was allotted to the 2nd Battalion, which he joined on 19 February 1916 at Tel-el-Kebir in Egypt. On 23 March 1916 Private Press embarked at Alexandria for France, on the Invernia, arriving in Marseilles on 28 March. Harry fought in the Battle of Pozieres in July 1916, which he survived without injury. He wrote a letter home describing the sophistication of the German trenches, which were dry underfoot and fitted with electrical lighting. On 20 October 1916 Harry was sent On Command to the Lewis Machine Gun School for Instruction. He rejoined the 2nd Battalion on 3 April 1917. Harry was reported missing in action on 18 May 1917. A court of enquiry, held on 15 October 1917 reported him to have been killed in action on 4 May 1917 during the Second Battle of Bullecourt. He has no known grave. Harry Press is commemorated on the Patrician Brothers’ Roll of Honour, St Joseph’s Church Orange Honour Roll and on the World War I Roll of Honour on the southern face of the Orange Cenotaph. There is a commemorative plaque in his honour at the Orange Cemetery, Catholic Section TH, Grave 329/331. In 1923 the Anzac Memorial Avenue of trees was planted along Bathurst Road to commemorate fallen WWI soldiers. 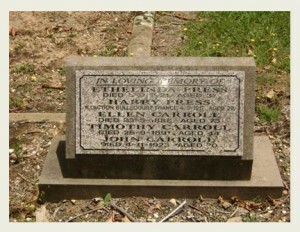 A tree was planted in honour of “Pte HJ Press”; it was donated by Orange High School. Very few of the trees are still standing today. Harry Joseph Press commemorative plaque, Orange Cemetery. Image courtesy Lynne Irvine. This entry was posted on December 4th, 2015.